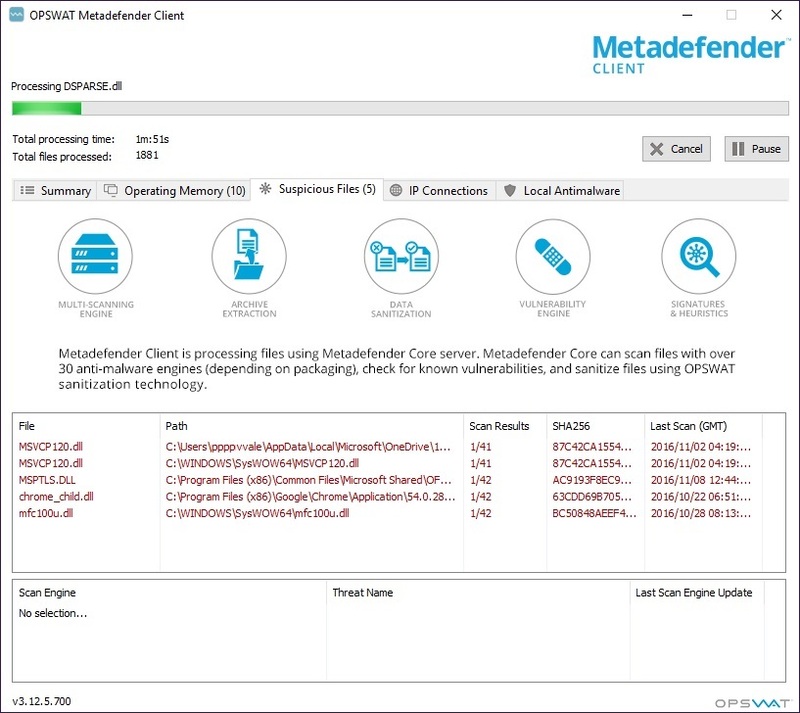 Metadefender Cloud Client is the most thorough free malware analysis tool available. 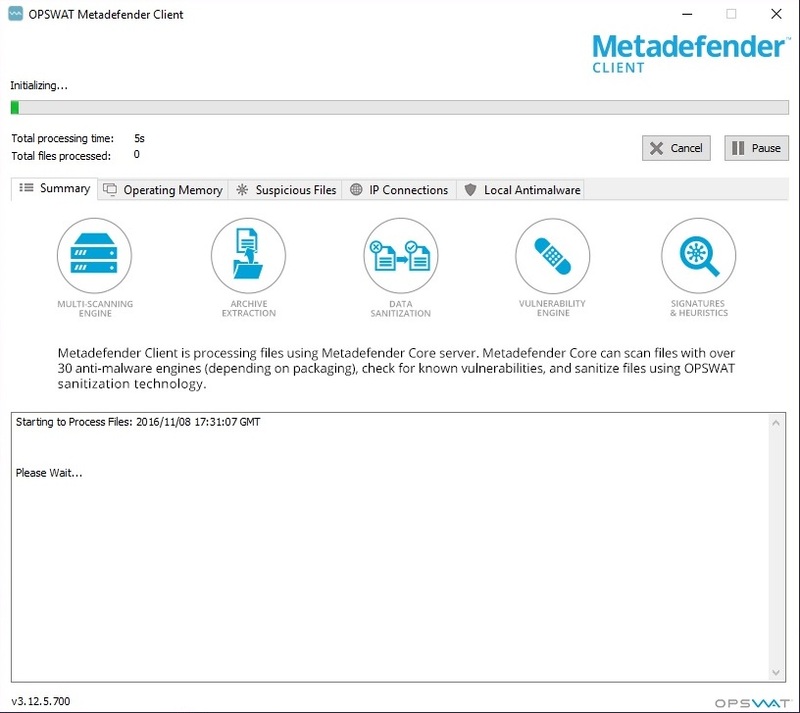 By running data through Metadefender Cloud, Cloud Client performs a deep endpoint forensic analysis for malware using several unique methods. Look for threats and assess the security state of your endpoint if you think it may be compromised. 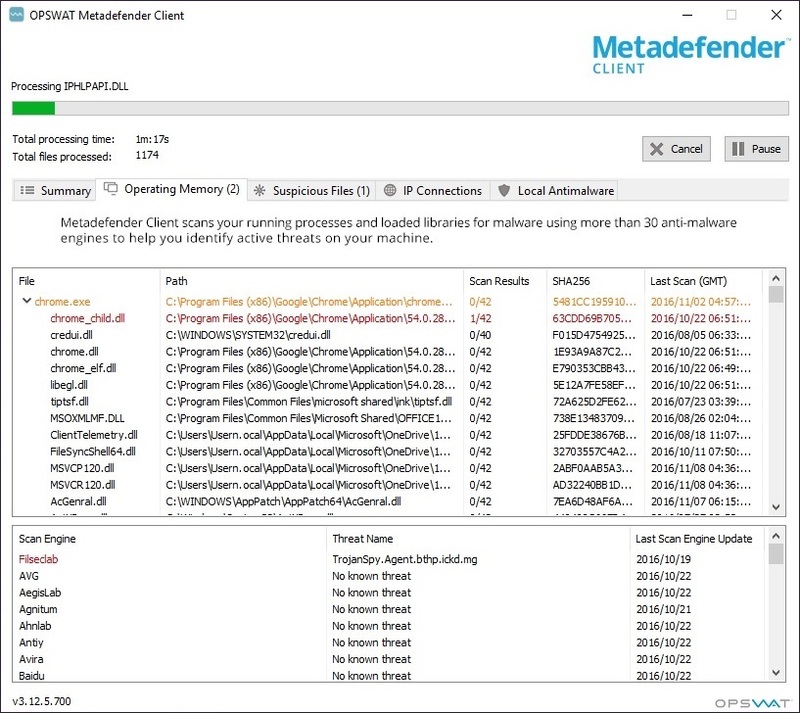 Running over 40 anti-malware engines that use heuristic detection, Metadefender Cloud Client analyzes all running processes and loaded memory modules. It performs a deep scan, analyzing the DLLs accessed by these processes for malware as well. This results in a deeper analysis than that of other free tools like Process Explorer or VirusTotal. 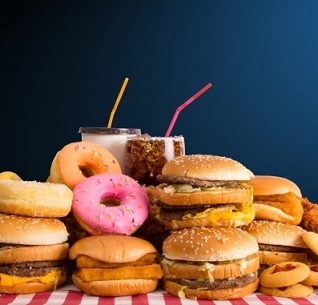 And it does all this quickly – in just a few minutes. 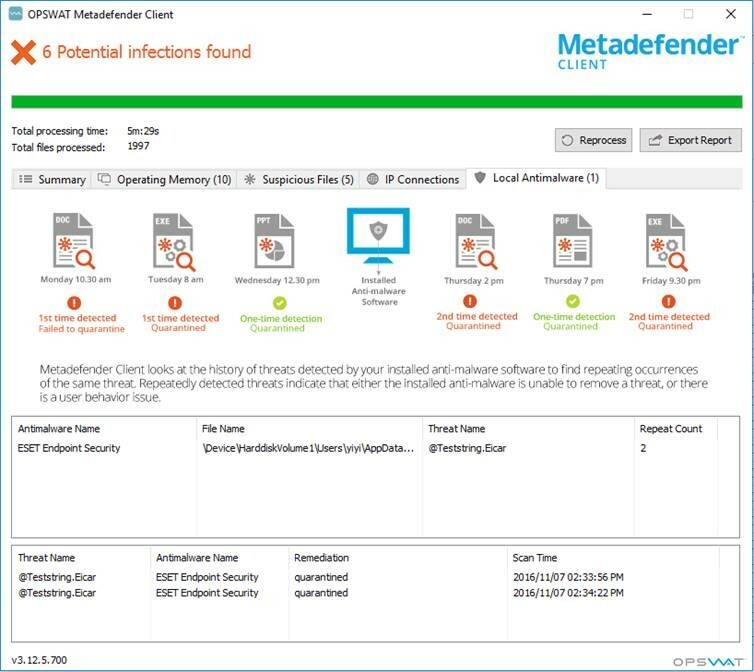 When you run it, Metadefender Cloud Client begins scanning all processes and DLL files for any threat. Once the analysis is complete, you’ll see a summary at the top of the window of how many potential threats of all kinds were identified. You’re able to click on each individual result and see the specific processes and DLLs that may be infected. Cloud Client is unique in allowing you to review the results on such a granular level. Highlight a process to see the results of the analysis. Click the arrow next to it in order to see the libraries accessed by the application while it runs. Then, click on individual DLL files to see the threats identified, and which specific anti-malware engines identified them. You can also see a list of potentially infected files on their own in the “Suspicious Files” tab. Click on each file to see the threats and which anti-malware engines identified them. 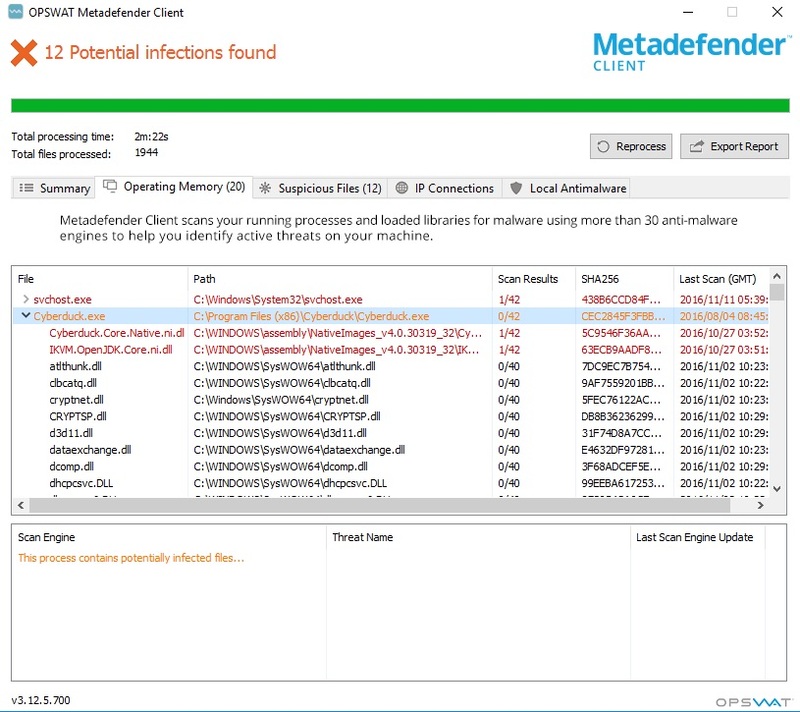 Simultaneously, Metadefender Cloud Client is also checking your local anti-malware engine’s history. Using a unique and effective method, Cloud Client analyzes the threats logged by your endpoint’s anti-malware engine, sifting through the data for patterns. This method of threat detection is another effective way of checking for potential malware infections. Your device is connected to a number of IP addresses at any given time, either through your web browsing or through a cloud software connection (such as Dropbox, Google Drive, etc). 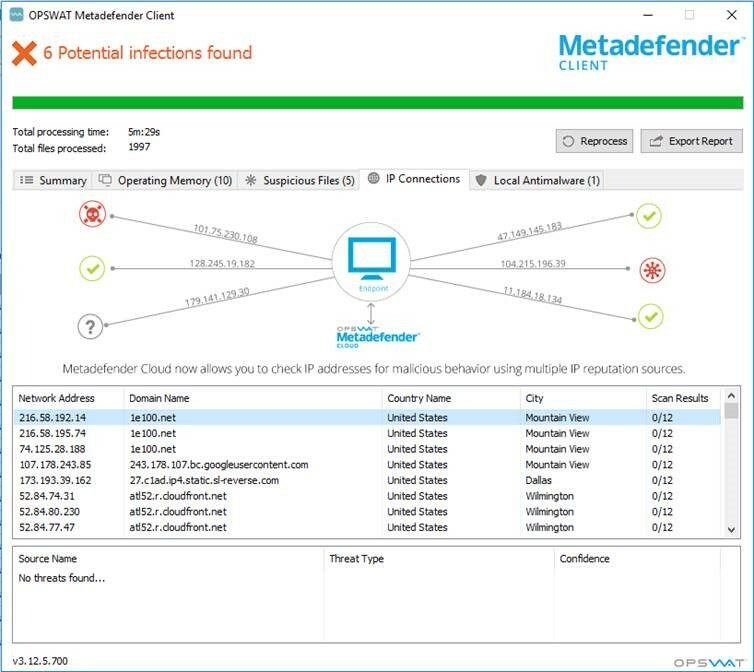 Metadefender Cloud Client compiles a list of all IP addresses connected to your device, and uses up to 12 IP reputation sources to check for low-reputation or rogue IP addresses. Connection to a rogue IP may indicate that your device is infected, as malware usually connects to networks through a rogue IP. 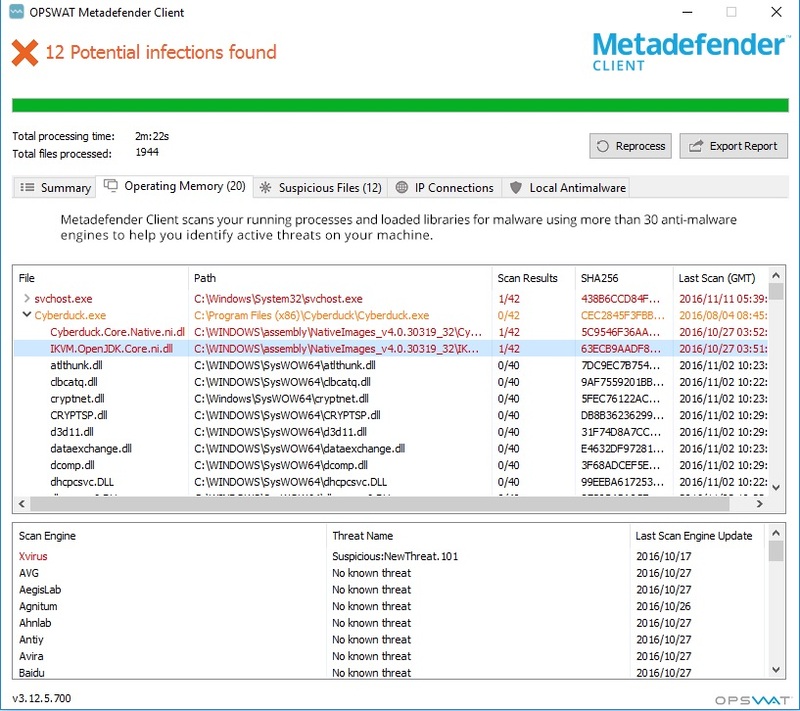 Use Metadefender Cloud Client when you suspect a machine is infected and you want to find out what and where the infection is. The tool gives you excellent visibility into your endpoint’s processes and the performance of your current anti-malware engine. 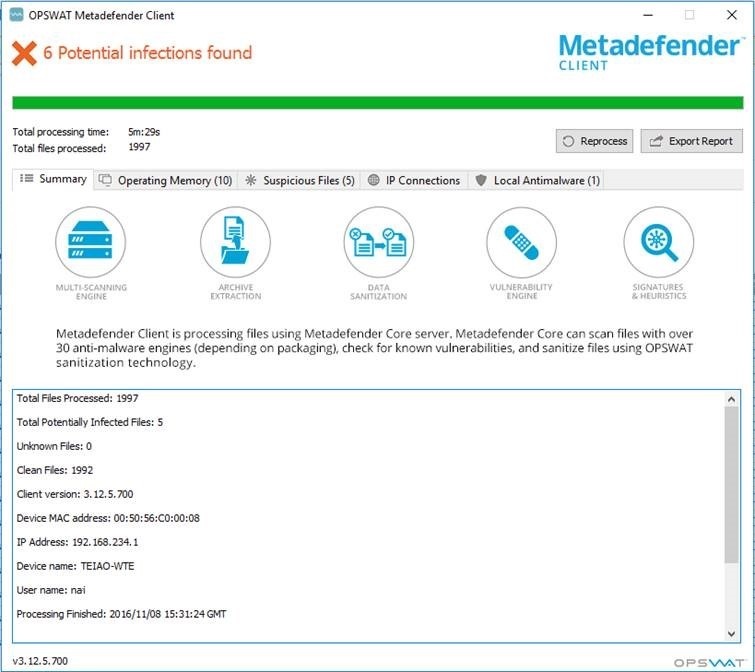 Metadefender Cloud Client runs one time and will not impact your endpoint's performance. 966 6,928 OPSWAT, Inc. <img src="https://www.oldergeeks.com/downloads/gallery/thumbs/metadefendercloudclient1_th.png"border="0"> Jan 21, 2019 - 12:42 4.1.4 43.31MB EXE , out of 26 Votes.